Hosta ‘Sum and Substance’ was chosen as Hosta of the Year in 2004. 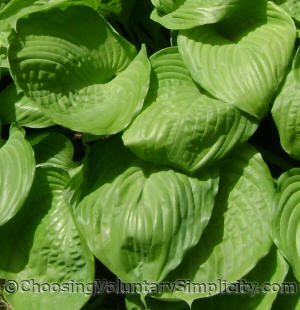 It is impressive because of its huge size, but I think it starts out as one of the least attractive hostas in early spring because its rounded chartreuse leaves stay crumpled for such a long time. I almost lost this hosta over one winter several years ago when chipmunks dug holes in my gardens and ate the roots, leaving this one in pretty sad shape. After years of limping along and looking really pitiful despite all the special care I was giving it, my Sum and Substance has finally recovered fully and this year has leaves that measure seventeen to eighteen inches long. 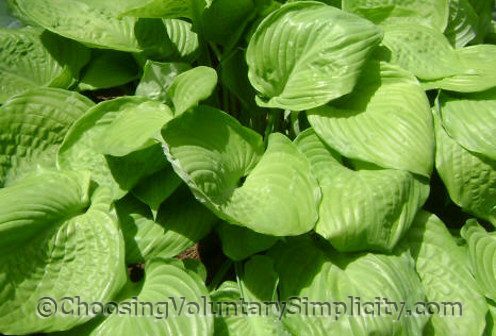 I have collected Sum and Substance seeds for a long time, and all of the resulting seedlings, like their parent, have grown to become hostas with exceptionally large leaves. I saw a sum and substance once that was HUGE. I went out and bought one and mine still needs work I guess because it is no bigger than the rest of my hosta’s. My favourite thing about this hosta is the beautiful lime-green colour. The size is impressive but the colour is what is most outstanding, I think. 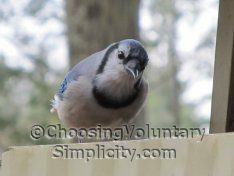 You got me started on saving seeds and I grew 2 seedlings from my Sum and Substance this year. They both have very big leaves and are the same color as your photo. I’m excited to see how they turn out.